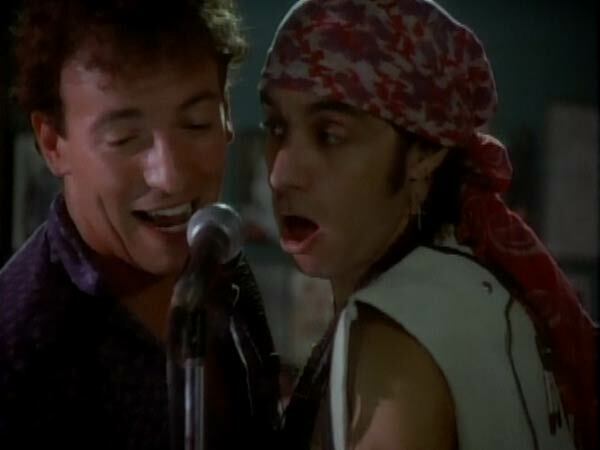 Although I was a bit late to the party, I've become a huge Bruce Springsteen fan since the E Street Band reunited in 1999. He ranks among my top five artists and is currently my favorite live act. I realize that I'm hardly in the minority in loving Springsteen's work, so I'll get to the point. Although 1984's Born in the U.S.A. was a huge album with famous music videos, it's less known that three were directed by John Sayles. The indie filmmaker's worldview matched that of the Boss, who'd explored America's roots with his previous album Nebraska. He'd only shot four movies by that point but was already building a reputation as a promising director. Springsteen had shied away from the mainstream spotlight in the past but was ready to take his shot at stardom with this release. He had a clear vision of the image he wanted to convey and needed a director who understood it. After working with Brian De Palma for the popular "Dancing in the Dark" video, he joined Sayles to present a trio of huge hits that pushed the album into the stratosphere. Let's take a look at these videos and how they built the Springsteen persona that remains in place today. Much has been written about the misinterpretations from Ronald Reagan, George Will, and plenty of others of this title track. The lyrics are hard-hitting and clear in questioning actions done in the name of patriotism. The tricky part is that they're backed by an upbeat melody and rousing chorus. The video shifts dramatically from the glossy feeling of "Dancing in the Dark" and shows a much rougher live setting. Springsteen isn't the nice guy who's going to pull Courtney Cox up on stage. Instead, he's an unshaven rocker in a jean jacket intensely focused on delivering the most intense performance ever. Sayles' camera pulls close and sticks with Springsteen's face, and we barely see other members of the band. This is all about his words and clearly drives home the message that everything isn't okay. 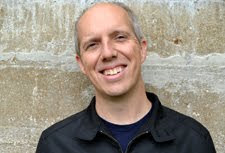 Sayles cuts between the live footage and shots of everyday Americans working at factories, serving in the military, having birthday parties, and just living their lives. Considering the massive success of this song and the album, revisiting this video is surprising. It doesn't feel like the typical product that will help to sell millions of records. This is a case where the words and music were so strong that all it takes is a straightforward video to make them work. 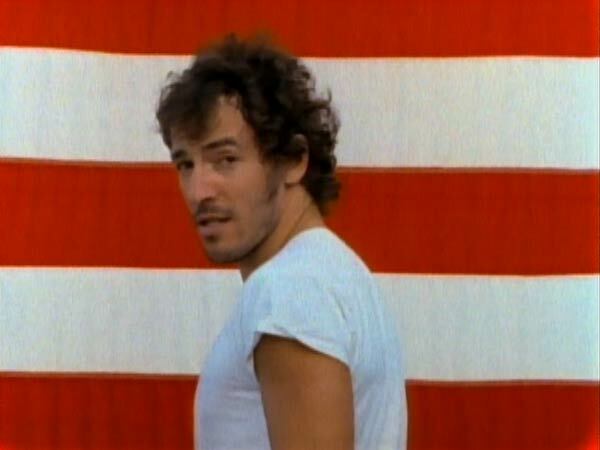 It ends with an interesting final shot of Springsteen in front of an American flag with a baseball cap in his pocket. This image matches the album cover and helps to project the "regular guy" image that's at the heart of the entire project. 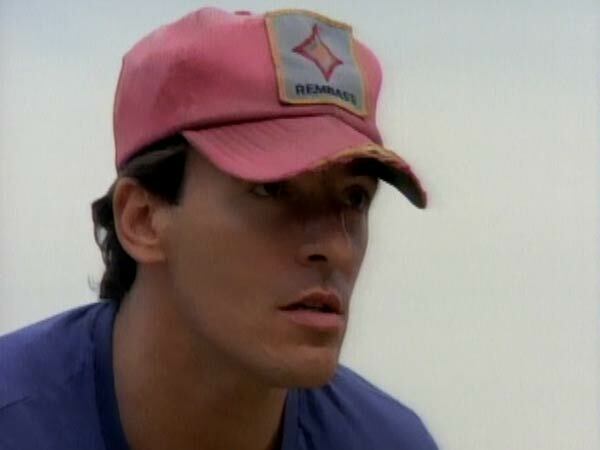 The video for "I'm on Fire" was the first example where Springsteen played a character that wasn't himself. The previous examples were mostly live performances and didn't tell a story beyond presenting the song's content. This one begins with a scene of Springsteen working as a mechanic and chatting with an unseen woman dropping off her car. Adding this framing structure made sense because the song isn't even three minutes. When the music begins, we see him getting out of bed and driving her convertible through the bright streets at nighttime. Springsteen repeatedly uses metaphors about cars in his songs, so these images fit right alongside the characters who frequent his work. Once again, this video is such a departure from the previous one and shows a completely different side of Springsteen. He's a quiet romantic who's "on fire" for this woman yet hesitant about this risky venture. He strolls up to her lavish house, drops the keys in her door slot, and strolls away without a word. It's a simple video yet fits perfectly with the song's dreamy mood. This is a regular guy who doesn't end up doing anything with the rich lady, but it's clear he's got a lot more on his mind than fixing the car. If any song comes closest to being a mission statement for the Born in the USA album, it's "Glory Days". Springsteen describes characters who have long passed the carefree days of youth, but they can't escape the feeling that nothing will ever be the same. 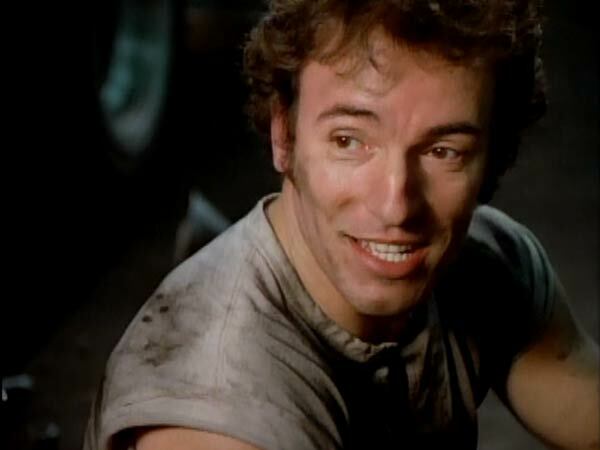 The video begins with Springsteen playing a construction worker who returns to the baseball stadium where he once shined. Wearing the red cap of the album cover once again, he throws to a cardboard catcher with visions of glory in his head. There's a feeling of regret to that scene, but it quickly disappears once the guitars take over. Sayles presents the E Street Band like a local act having a great time performing in a small club. Despite his move to gigantic arenas and stadiums, Springsteen has worked tirelessly to retain that feeling that he's just playing for a few friends at the local bar. It may be a brilliant disguise, but it's nearly impossible not to tap your feet and dance to the music of this energetic group. While they blast away, Sayles cuts back to the character who sits at home watching baseball with a far-away look in his eye. This is one of Springsteen's best party songs, yet the lyrics tell a different story of people unwilling to escape the past. It's far from a dire feeling, however, and we even get shots of the guys' kids cheering him up. We all wonder about the past, but a great concert can quickly make you forget those worries. Rock 'n' roll saves the day, even if that feeling only lasts a fleeting moment. Great article. I'm a big Springsteen fan, but I honestly haven't seen much of Sayles' movies. So, this was informative and I'll go check then out. Brilliant disguise? I like what you did there. Thanks Shane. Glad you caught the Brilliant Disguise reference. If you're looking to check out some Sayles films, Lone Star and Eight Men Out are great places to start. I think he also did one for Atlantic City. No Bruce in it, though. I looked around and couldn't find any mention of Sayles doing the Atlantic City video. Of course, I also didn't locate who shot it, so it's totally possible. Thanks for the comment! Who was the "unseen woman" in the video I'm on fire? From what I've read, the woman was a model they hired, and the voice was Maggie Renzi, John Sayles' partner and the producer of the videos.